Halloween- because dress up isn’t just for those under 10. Ah Halloween….one of my favorite holidays. Actually I love all the holidays except for Valentine’s Day, (single girls should get heart-shaped boxes of chocolate too!) I love Halloween for three reasons and three reasons only- let me list them off in order of importance. (1). I love candy and Halloween is an excellent excuse to stuff my face with Reeses, M&M’s, Almond Joy’s and giant Hershey’s Milk chocolate bars. (2). I love watching the old Disney channel Halloween favorites; Hocus Pocus, Halloweentown I-IV and Nightmare before Christmas (although technically Nightmare before Christmas was released through Touchstone Pictures). I even like the Tower of Terror with Steve Gutenberg and Scream Team with Monty Python’s Eric Idle. The only movie I refuse to watch is Don’t Look Under the Bed; not only is it terrifying, but it’s also surprisingly spot-on regarding the mess that collects under one’s bed. (3). I LOVE DRESSING UP. I love making my costumes from scratch and over-analyzing it’s authenticity. I love sewing sequins and dying fabric to match the color of my shoes. I love making costumes for my friends and family (especially if we are going with a group theme) and I love wearing fake eyes lashes and crazy wigs. It’s my one chance each year to wear what I would want to wear everyday. And isn’t that why most of us love Halloween? We grow up being encouraged to use our imagination, yet when we reach adulthood make-believe is discouraged. Halloween presents an opportunity to take back make-believe, if only for one night. As the better half of Lemonzest and Pearls, Meggan is sharp, quick-witted and full of energy. She is also obsessed with Disney. She’ll admit it. In fact, when I told Meggan I was going to be interning as Walt Disney World, I think she was more excited than I was. So it comes as no surprise that she would choose Belle from Beauty and the Beast as her costume. Check out what she said…. 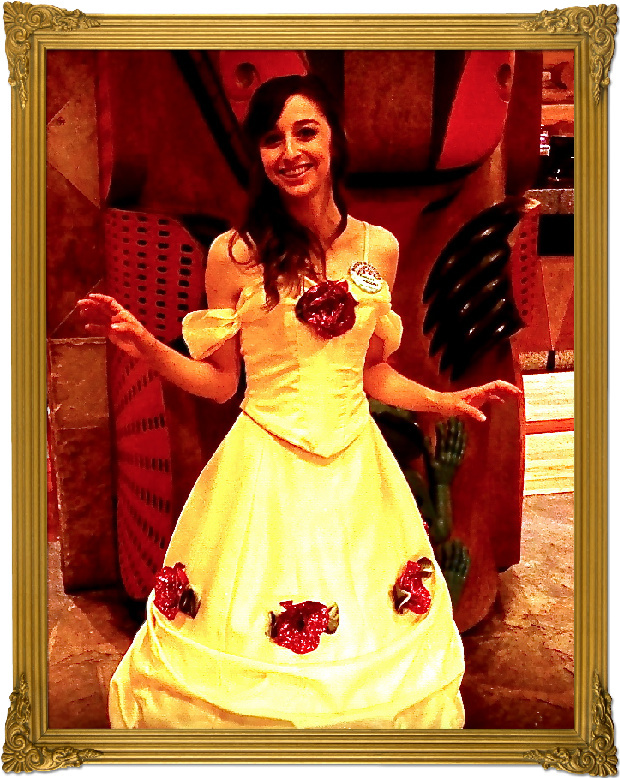 I have to agree- Who wouldn’t want to be Belle for a day, especially when your costume is as pretty as that! Sidenote: As much as I love Belle, if I was going to be a Disney Princess for Halloween, I would choose Rapunzel from Tangled; she’s my Disney favorite! When I first met Kaitlyn in the dorms, I knew I was going to have an interesting roommate. Not only is she charismatic and endearing, but she can drop it low better than Beyonce. She has a wonderful sense of humor and loves to make everyone one around her laugh. So it makes sense that she would take a chance on an unusual costume. Here’s what she had to say about it…. 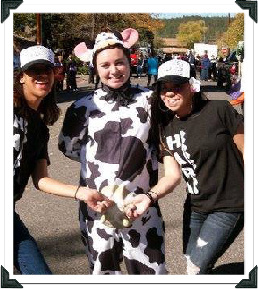 Well Kaitlyn, I’m not sure I would want strangers playing with my udders, but I bet you made a bunch of new friends. You do look cute as a cow though; maybe you should wear the cow costume when we hit the dance floor- you could show off your mooooves. What can I say about Arielle? She’s been one of my best friends for years now. She’s unconventional, intuitive, and share’s my quirky side. 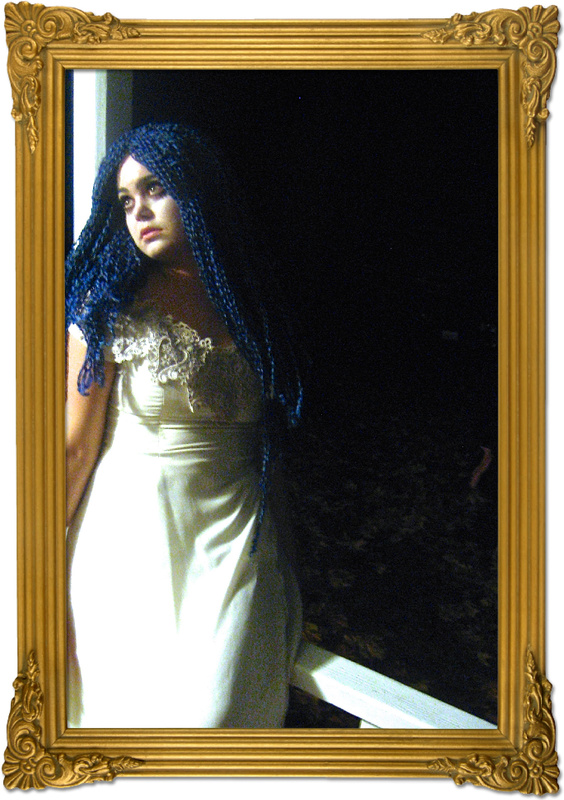 She is also very creative and put a lot of time and effort in her Corpse Bride costume. I was amazed when I saw the end result! Here’s what she had to say about her one-of-a-kind costume! That’s what I call dedication! She even studied her character! Some might think thats over the top but no one can deny that she nailed the look! With a costume like that, Arielle looks like she came straight out of a Tim Burton movie! I have always had an affinity for Barbie; maybe it’s because I was homeschooled and lacked the proper social interaction (just kidding) or that I secretly wished all her clothes came in my size. Whatever the reason I have always been a Barbie girl. Her style (while it might be over the top) is always on trend and eye-catching. She drives a pink jeep. She owns real estate (granted it’s the Barbie Dream House, but I’d like to think that plastic doll houses are recession proof). She’s in a deeply committed relationship with Ken (although I had a ton of Barbie dolls and only one Ken, so usually the deeply committed part was solely one Barbie’s side). Basically, at a youthful age of 52, Barbie’s living the life. That is why my favorite Halloween costume so far was Disco Barbie; complete with a knee-high silver boots, pink sparkly dress and long platinum wig. And a life-size pink Mattel box. Needless to say, the costume was awesome and I got a lot of high-fives (though I couldn’t return them because I was in the box). 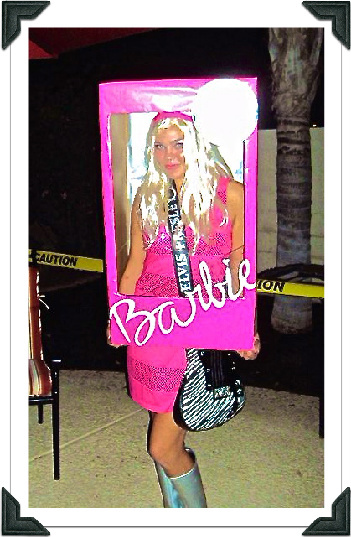 I loved being Barbie for the evening and I truly enjoyed putting my costume together piece by sparkly piece. I hope you have been inspired (if you weren’t before) to get dressed up for Halloween. You don’t have to like ghosts or ghouls, or even like candy (unimaginable as that may be). But you should embrace your inner juvenile self; put on a costume and let the fun begin!